« Hot-head of dance », multi- talented artist, « astonishing in her way of dialoguing with extremes on stage » Kylie Walters, « the arrow », has performed internationally as a dancer and actress for respected choreographers and directors. She is a singer/songwriter with different bands/productions (AU Bad with guitarist Seb Martel & guests, The Adventures of Huckleberry Finn with Pierre Omer, Mutant Slappers with KMA rock). Kylie Walters is artistic director of the company Ornithorynque producing her own creations (see below). Her work examines the interface of myth with everyday life. Australian by origin, established in Europe, Walters’ career embraces theatre, dance and music producing live performances works and films. Walters initially trained in music and dance. She holds a BA in Dance from the Victorian College of the Arts, Melbourne University, Australia (1991) and a MSc in Public Health from the London School of Hygiene & Tropical Medicine, University of London (2016). 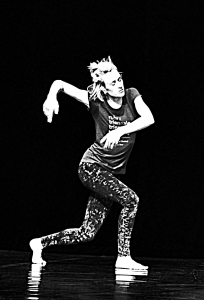 She works with musicians, artists, directors and choreographers including: Tim Etchells / Forced Entertainment, Wim Vandekeybus / Ultima Vez, Davis Freeman / Random Scream, Seb Martel, KMA rock, Jozsef Trefeli, Pierre Omer, Lloyd Newson / DV8 Physical Theatre, Nicole Seiler, Guilherme Botelho / Alias Compagnie … and has featured in films for television and cinema in the UK, France, Belgium and Switzerland for directors Miranda Pennell, Pascal Magnin, Wim Vandekeybus, Vincent Pluss, Christophe Perton, Raymond Veuillemos, Nicole Seiler and Alexandre Iordachescu. 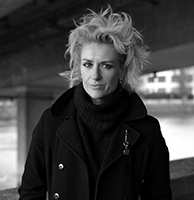 In London, she collaborated with English artists including art/film director, Miranda Pennell and the late choreographer Jeremy James. Kylie Walters joined Guilherme Botelho’s Alias Company (CH) in 1995, creating over a period of 8 years, roles which indelibly marked the company’s work. She worked with the Swiss video artist/choreographer Nicole Seiler from 2004 to 2007 on four pieces. The solo Madame K, created with & performed by Walters, was an immediate success, touring for over four years and spawning the performative spin-off K-Two which is still performed to this day. Walters joined Lloyd Newson’s DV8 Physical Theatre (UK) in 2006, creating & touring Just for Show. Critics praised her charisma and performance. With Wim Vandekeybus’ company Ultima Vez (BE), Walters performed stand-out roles in Menske (2007/2008), NieuwZwart (2009-2013) & in the rock event What’s the Prediction (2008-2013) featuring musicians Mauro Pawlowski, Daan, Marc Ribot, Woven Hand… She plays a perverse gymnastics teacher in Wim Vandekeybus’ first feature film Galloping Mind released at Cannes Film Festival 2015. For director Davis Freeman’s activist/performance group Random Scream (BE) Kylie Walters collaborated and performed in Saving Lies (2009) & Expanding Energy (2011/2013) with Freeman, Jerry Killick (Forced Entertainment), Paul Lemp (Candy Bomber) & Jochen Arbeit (Einstürzende Neubauten). In 2014 they were laureats of Danse Elargie at Theatre de la Ville in Paris with What you need to know which subsequently toured 7 major cities. Kylie Walters is a choreographer, actress, and singer/songwriter for theatre productions including: LES BELLES COMPLICATIONS at the Theatre Populaire Romand (TPR); Les Aventures de Huckleberry Finn (2016) by Mark Twain, director Yvan Rihs, Une Enéide (2015) by Virgil, director Sandra Amodio, Sils Kaboul (2015) director Anne Bisang. 5 Jours en Mars (2013) by Toshiki Okada, director Yvan Rihs, Yvonne, Princesse de Bourgogne (2011) and Les Chevaliers (2009) by French theatre collective Nöjd and was director’s assistant to the English playwright and director Howard Barker for Innocence (2014) mounted and published in French with Nöjd for the Célestins Theatre in Lyon. She choreographed for Roberto Zucco (2010) by Bernard-Marie Koltéz for La Comedie de Valence, directed by Christophe Perton. Walters has worked and performed with Ibsen Award winning Forced Entertainment on their production, The Last Adventures (2013), directed by Tim Etchells (2016 Spalding Gray Prize) and featuring Lebanese sound artist Tarek Atoui and guest musicians including drummer Uriel Barthelemy, trumpeter Mazen Kerbaj, guitarist Charbal Harbor and all rounder KK NULL as part of the 2013 RuheTriennale and still touring. In 2015/2016, Kylie premiered AU, a work created with Christian Ubl, Seb Martel and Gilles Clément. AU is currently touring. 2012 Mutant Slappers & The Planet Bang dirty noisy rock concert/performance with József Trefeli & KMA. Touring. 2012 The Chinaski Sessions featuring Belgian band I Love Sarah. Command from David Hughes Dance Company, Scotland, toured Scotland & England in 2012. 2005 Sweet Hypochondria a solo which enjoyed a sell out season in Geneva, toured to London’s Royal Opera House Clore Studio and L’Octogone, Lausanne in 2006. 2005 Travel on the Cheap short solo created specifically for the Danza Urbana festival in Bologna (IT). 1998 Kylie and Mikel a series of duets with Mikel Aristegui performed in Switzerland, which inspired the film, LieberSbahn (2003) shot in Berlin. These creations form the basis of Walters’ company Ornithorynque. « Tête brûlée de la danse », artiste polymorphe, « sidérante dans sa façon de tutoyer l’extrême sur un plateau ». Kylie Watlers, « la flèche », irradie les scènes internationales depuis de nombreuses années comme interprète de chorégraphes de renom, ou à l’occasion de ses propres pièces. D’origine australienne, établie en Europe depuis 20 ans, Kylie Walters suit une formation en musique et en danse. En 1991, elle reçoit le Bachelor of Arts Degree du Victorian College of the Arts, University of Melbourne en Australie. Kylie Walters collabore avec Forced Entertainment pour The Last Adventures, mise en scène de Tim Etchells avec la musique (presence live) de Tarek Atoui pour le 2013 Ruhetriennale, direction artistique – Heiner Goebbels. Avec le directeur Davis Freeman’s performance/activist group Random Scream (BE) Walters travaille sur la pièce Saving Lies (2009) et collabore encore une fois avec Freeman, Jerry Killick (Forced Entertainment), Paul Lemp (Candy Bomber) & Jochen Arbeit (Einstürzende Neubauten) dans Expanding Energy (2011/2012). Ils sont lauréate de la concours Danse Elargie (2014) au Theatre de la Ville à Paris avec What you need to know. Pour la compagnie Ultima Vez (BE) de Wim Vandekeybus, elle joue des rôles remarquables dans Menske (2007/2008) nieuwZwart (2009-2013) et l’événement rock, What’s the Prediction (2008-2013) avec musiciens Mauro Pawlowski, The Pawlowskis, Black Box Revelation, Daan, Marc Ribot, Woven Hand. Elle joue dans le nouveau film de Wim Vandekeybus’ Galloping Mind (2015 release). Elle danse pour le chorégraphe Nasser Martin-Gousset (F) dans Pacifique (2010-2012). Kylie Walters rejoint la compagnie londonienne de Lloyd Newson, DV8 Physical Theatre à l’occasion de la création et de la tournée du spectacle Just for Show (2005/2006). Les critiques ont mis en avant le charisme et la performance de Kylie Walters. A Londres, elle a collaboré, avec les chorégraphes anglais Jeremy James, Mark Baldwin ou Michael Clarke (1991-1995). En 1995, elle rejoint à Genève la Compagnie Alias (Guilherme Botelho) et participe pendant 8 ans aux différentes créations. Pendant cette période, elle créera de nombreux personnages marquant les spectacles de la compagnie. Depuis 2004, Kylie travaille avec la chorégraphe et vidéaste Nicole Seiler sur 5 projets. Madame K, un solo spécialement co-créé avec elle, connaît un succès international explosif. Kylie Walters chorégraphe pour le théâtre sur plusieurs productions: 5 Jours en Mars (2013) de Toshiki Okada, mis en scène Yvan Rihs ou pour Yvonne, Princesse de Bourgogne (2011) et Les Chevaliers (2009) par le collectif nöjd (FR) et elle est assistante bilingue à la mise en scène pour l’auteur et mettre en scène Anglais, Howard Barker’ pour Innocence (2014), aussi avec Nöjd au Théâtre du Célestins à Lyon et en tournée. Elle chorégraphe pour Roberto Zucco par Bernard-Marie Koltes pour La Comédie de Valence (FR), mise en scène Christophe Perton (2010). Kylie Walters travaille avec Forced Entertainment sur la production, The Last Adventures (2013), mis en scène de Tim Etchells avec l’artist sonore Libanais Tarek Atoui pour le 2013 RuheTriennale (commissaire – Heiner Goebbels). Cette pièce tourne encore. En 2014 aussi, Kylie collabore avec Serge Teyssot-Gay pour le Festival Antigel , elle tourne Mutant Slappers & The Planet Bang et Not Even Wrong (N.E.W.). En 2015, elle présente et tourné sa nouvelle création AU avec Christian Ubl, Seb Martel et la collaboration exceptionnelle de botanist, jardinier et écrivan Gilles Clément. Elle est dans la nouvelle création de Yvan Rihs en tant que actrice et assistante pour son adaptation de Mark Twain’s Huckleberry Finn à voir en Suisse en 2016.